If you want a fence this year and wish to maximize the time you have to enjoy it with your family and friends—contact us today and we will be happy to work with you to design a fence solution that meets your needs and your budget. We service the following areas in Northeastern Wisconsin: Appleton, Wisconsin, WI, Kaukauna, Little Chute, Darboy, Sherwood, Neenah, Menasha, Greenville, Oshkosh, Green Bay, De Pere, Freedom, Wrightstown, Waupaca, Manawa, Shawano, Fox Cities, and the Fox Valley. It’s simple! We care about our customers needs and we always treat people with respect. Customer satisfaction is our main objective – along with adhering to industry standards on every project. Our ambition is to provide you with the highest quality fence at a great value! 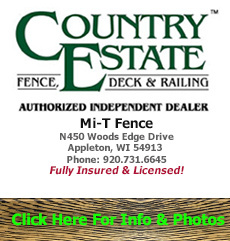 MiT Fence is located in Appleton ( Fox Valley ) Wisconsin and specializes in planning, sales & installation of poly-vinyl fences, steel fences, ornamental fencing, wood fencing and chain link fencing. We service the following areas in Northeastern Wisconsin: Appleton, Kaukauna, Little Chute, Darboy, Sherwood, Brillion, Chilton, Kiel, Neenah, Menasha, Greenville, Oshkosh, Green Bay, De Pere, Freedom, Wrightstown, Waupaca, Manawa, Shawano, Manitowoc, Sheboygan, Fond du Lac, Fox Cities, and the Fox Valley. Why choose Mi T Fence? 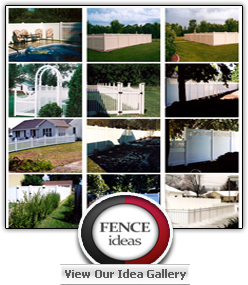 Why do the people of the Fox Cities (Appleton, Menasha, Neenah, Kaukauna areas), Oshkosh, Green Bay and Shawano areas select Mi-T Fence time and time again? It’s simple! We care about our customers needs and we always treat people with respect. Customer satisfaction is our main objective – along with adhering to industry standards on every project. Our ambition is to provide you with the highest quality fence at a great value! This can be accomplished with nearly any budget! 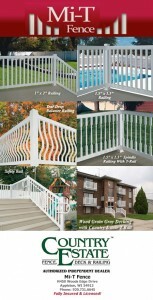 We are here to help you with your fence needs! Your needs may not require the same end result as your neighbors. You have options, maybe more than you may even realize. For example, treated lumber is priced lower than cedar; galvanized chain link is more reasonable than aluminized chain link fabric compared to wood posts; concrete posts versus driven posts. You have plenty of options and these are just a few! We can work with you to get the fence that is right for you! 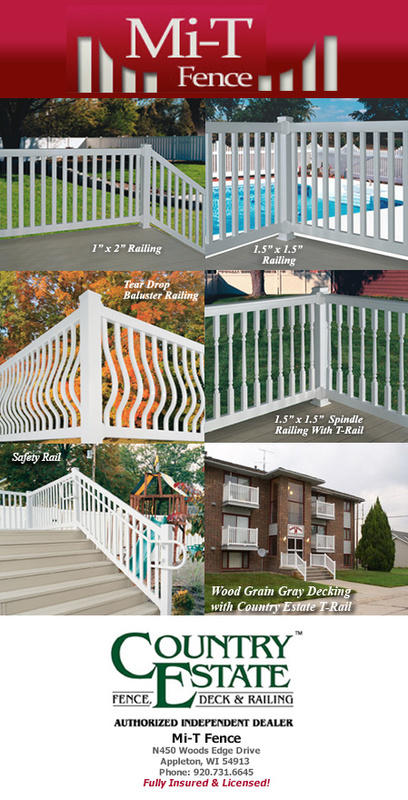 We specialize in fences with many styles and colors, using the highest quality of materials available and expert installation. We can help you with planning, design, permits, property lot line location, fence type, installation, fence colors, and post pounding/driving. If you have a special fence request, like wanting an arbor over your picket fence gate – we can do this for you! Or if you want lattice over your cedar privacy fence – we can help with this as well! We will exceed your expectations! We will take on any special request with confidence. Our mission is to provide you with a beautiful fence that offers privacy, protection and peace of mind for many years. When it comes to getting the job right, Mi-T Fence knows how to deliver! We invite you to visit our outdoor display area! Make sure you also check out our online galleries here! And for your own peace of mind, Mi-T Fence is fully licensed and insured! As an Authorized Independent Country Estate Dealer, Mi T Fence will come to your home or business to provide an obligation-free quotation to help you complete your projects. 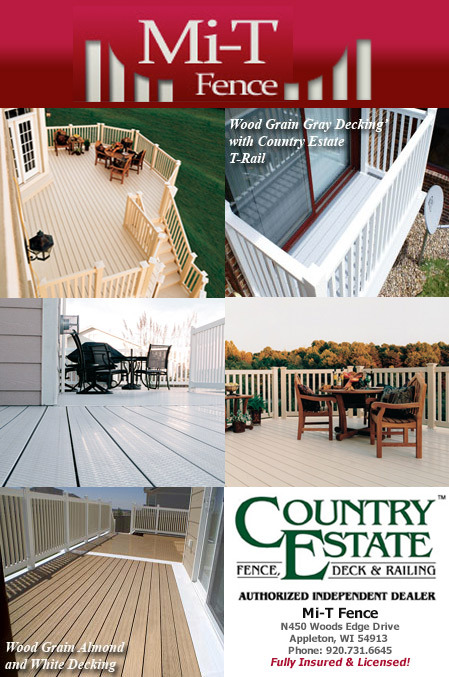 Country Estate Polyvinyl Decking is beautiful, durable and priced competitive with redwood. It eliminates chemical cleaning and preservation treatments. And this vinyl decking doesn’t squeak when you walk on it. Country Estate Decking is made from 100% virgin PVC. Without the need for waterproofing with sealants or chemicals, Country Estate Decking is a safe play surface for children and pets. Available in white, almond, gray, and adobe. Always cool to the touch and kind to bare feet. Surface is embossed for a non-slick surface. Much easier to wash than wooden or concrete surfaces. Available in white, gray, almond and adobe. Country Estate Decking is made from 100% virgin PVC. Never discolors from pressure washing or constant exposure to water. Forget slivers, rotting deck or squeaks. No nail heads to snag- snow scoops off easily. No more waterproofing with sealants or chemicals again – a safer play surface for children.